But there were problems. Those were the doubts and fears that barged their way into my dreams. They tried to divert what was arguably one of my most intense life experiences. I grew up on a council estate in a Jamaican family that scoffed at the very idea of travelling. When I told my parents, my aunts and my uncles that I planned to give up my current job, to travel and “broaden my horizons” and learn about indigenous cultures that were unlike my own, they were sceptical. Then I told them I was going alone, with little more than £4000 in my pocket and their doubt and scepticism turned to abject horror. They relayed all the gruesome stories about backpackers meeting untimely ends when they ventured abroad. They told me I’d run out of my money. They told me I’d get killed or kidnapped. They said I wouldn’t be accepted. “Why don’t you just concentrate on your career?” They asked. “You’ve got a good job that pays well. Why are you giving it up?” they insisted. For them, they were not being negative. They were being realists. But my reality did not match their reality. Their reality was based on fear of the unknown. My perception was based upon a very different fear. That was the fear that I would never realise my dreams. The fear that every day would look just like the last unless I did something different. Einstein once said that doing the same thing over and over again and expecting a different result is the definition of insanity. So I set about the perfectly sane process of stepping outside my comfort zone. I decided to take risks in order to learn more about this planet that I inhabited. I’d spent so many months planning, imagining, saving, and matching my desired activities with my budget, so I decided that it was time. So with my goals and my vision in mind, I packed my bags, reassured my mum I’d be back before she put the kettle on and set off on what was to be the greatest adventure of my life. Some of the best adventures I had while travelling, were those I did not plan. They were the scary ones that took me off the beaten path and delivered me into the hands of fate alone. As it happens there were many of those adventures. But if I told you about them all, this blog would be a thousand pages long. Instead, I’ll focus on just one: the wonderful 3 days I spent in an authentic long neck Karen Village just 30 miles from Pai, Thailand. It taught me more about life than any textbook I could ever read. You have to understand, I left England not even knowing how to read a map. But when you find yourself at 1am in the morning getting off the overnight bus in Chiang Mai trying to find your way to a hostel in a back alley, then you learn pretty quick, believe me. So in many ways my trip was a baptism of fire, but I emerged from it as a new person. I came back as someone who appeared to be the same on the outside, but on the inside I had fundamentally changed in a way that I still cannot completely describe. I used a website called Workaway to look for volunteering activities in Thailand. One such opportunity quickly caught my eye. It was an advert by an American lady called Christine who worked with the long neck people in Thailand. 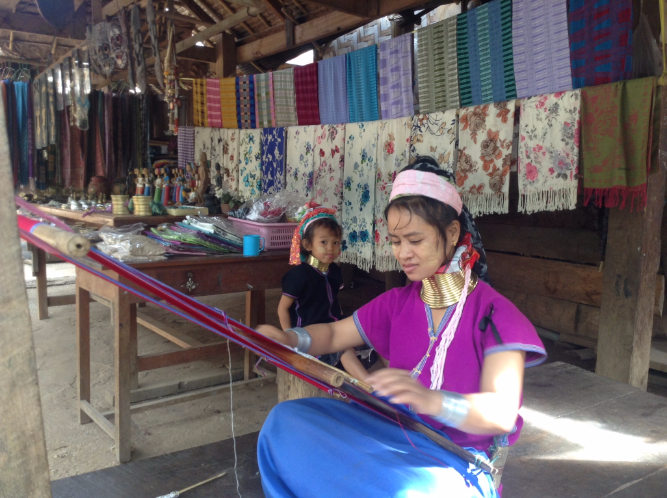 They are also known as the Kayan people, which are a sub-group of Red Karen (Karenni people). Christine had set up a Co-Creation Project designed to increase self-sufficiency among the members of that tribe. The vast majority of the Kayan tribe originate from Myanmar. However, due to the oppression they faced from the Burmese government, they fled to nearby Thailand, only to face similar discrimination by the Thai government. In Thailand, the only industry they are legally allowed to participate in is tourism. What often happens is they are exploited by employers in Thailand who force them to work long hours in ‘fake villages’ where the women are made to stand behind stalls all day and sell manufactured items to the tourists, who take pictures of them. The profits they make, along with any wages they may be due, are often withheld by their employer. Their living conditions are slave-like and the women are separated from their families. 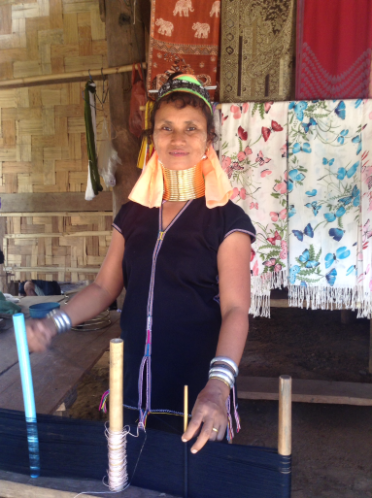 Employers prefer to hire women as opposed to men to work in these fake villages because the distinctive coils that the women wear around their necks help to draw in the tourists. 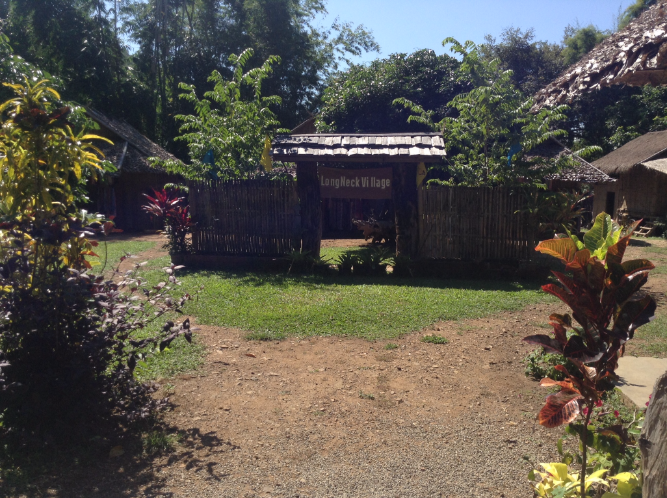 These villages are often small, with well-kept huts for tourists to stay in. It is about as far away from a genuine experience as it is possible to get. What Christine did is she spent many years gaining the trust of long neck villagers and working with them to promote a more ethical, mutually beneficial form of tourism. 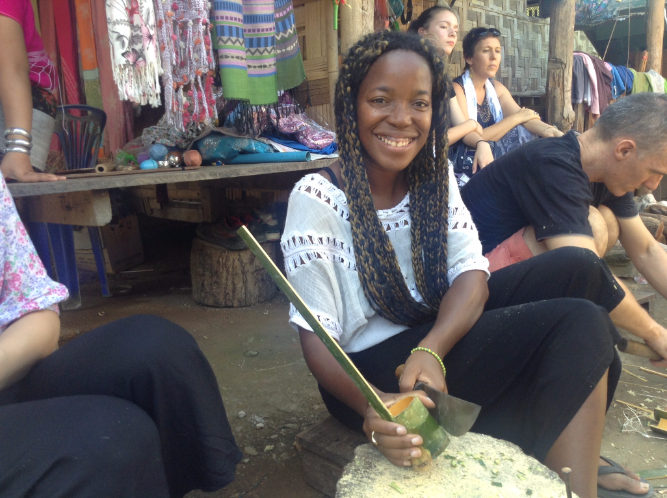 She promoted tours where people could go and visit an authentic village and take part in a series of activities, designed to educate people about the real culture and issues affecting the tribe. 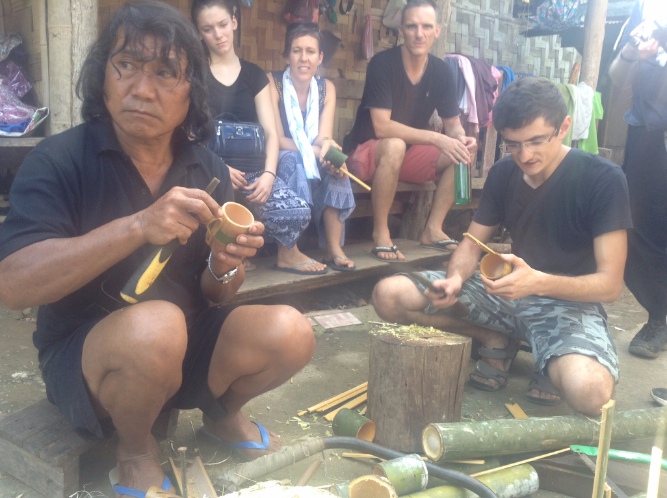 The villagers would also interact with the tourists to find out more about their lives. In other words, it was a type of cultural exchange. I was selected to work with Christine to help organise the activities and write a series of blogs and Facebook posts as part of a bid to attract more tourists and promote the project. Essentially, it was a type of marketing internship where I was in charge of promoting the tours to overseas visitors, educating them about the aims of the project and liaising between the villagers, interpreters and project managers to create new activities and initiatives. When I first arrived, the programme was just getting started and there was plenty to do. We spent many long, hot days sitting in the field at the back of Christine’s house swatting away the mosquitoes and brainstorming the activities that we would participate in. On other days we were building mud bricks in Christine’s gardens for future volunteers and doing the gardening. In that 40 °C sun, it gave me the most intense workout I’ve ever had in my life. Two days later, we set off in a camper van and made our way to what I was told was an authentic long neck village south of Pai. Before we made our way there, Christine instructed me to walk to a nearby fake village and spend 10 minutes looking around, just so I could see what the difference was when I finally arrived in the authentic village. I did as instructed and I wanted to leave in less than 5 minutes. 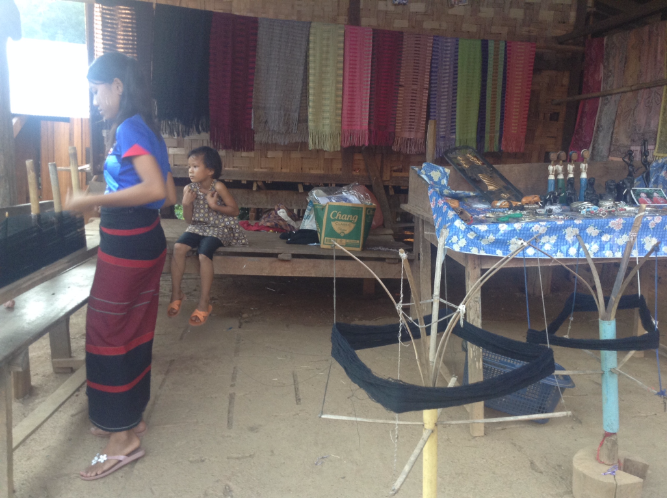 The fake village had one lonesome bare and empty hut with a bed for tourists and two extremely unhappy Kayan women standing behind a stall trying to sell their wares. When I arrived at Huay Pu Keng, an authentic, village where the tribe members lived, a man with a small wooden canoe greeted us. We crossed the river in that rickety old canoe and climbed a small hill before walking through the jungle to get to the village. Now this was the real thing. Chicken, pigs and puppies ran amok, while sweet young children came to greet us. There were rows and rows of stalls, huts and makeshift shops, with smiling men, women and children. 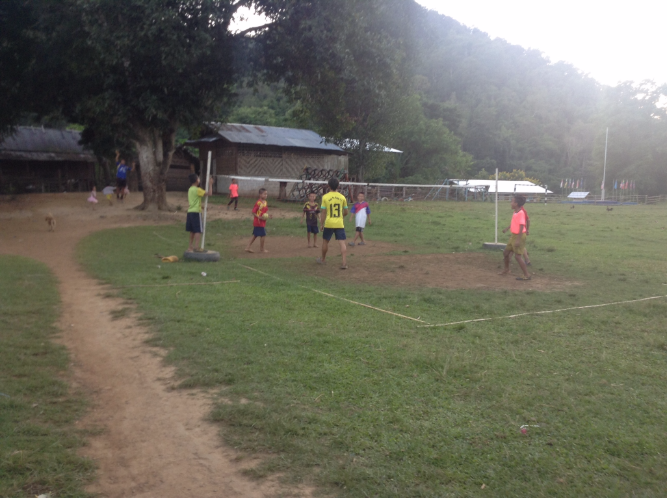 We also stopped for a short game of football before heading off to see the rest of the village. 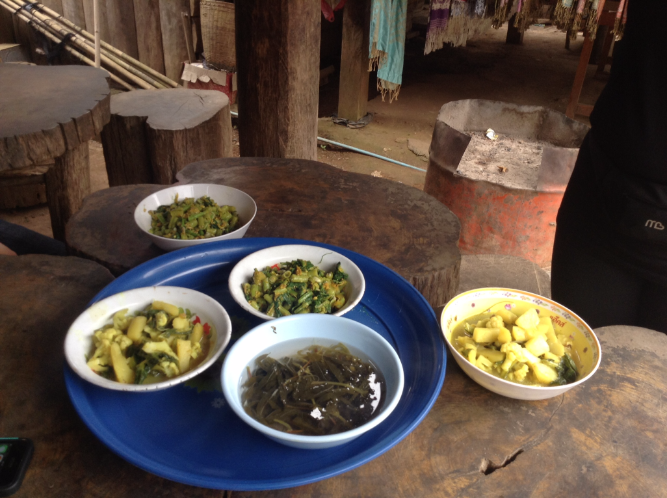 The smell of Burmese curry filled the air as we made our way down the dirt road and followed Christine into a small hut. We spent some time there talking to some of the elders in the village, with the help of an interpreter. The next few hours were spent making posters for the launch event we were planning to hold in 3 days time. A fun task that was assigned to me was to come up with creative activities that enabled us to communicate with the local Karen community, without the aid of interpreters. I did this by creating a card game, with a series of drawings designed to represent basic introductions. I also worked with the interpreter to create multi-lingual cards and posters with English, Burmese and Kayan – a Sino-Tibetan language. 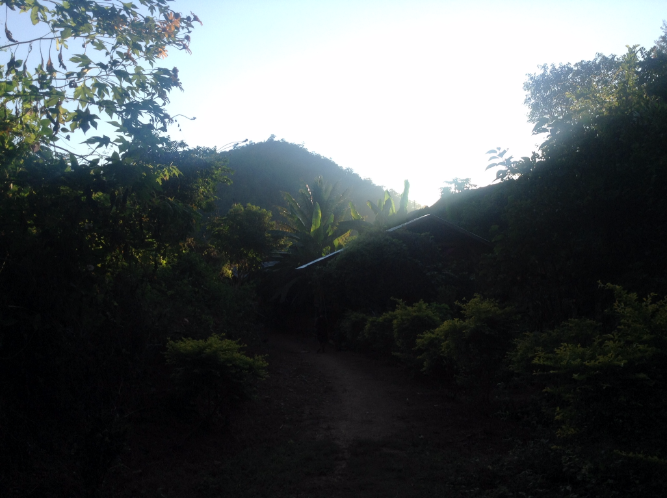 I then spent the rest of the evening walking in the sun, playing football with the local children and taking a stroll through the surrounding forest. This was followed by a delicious Burmese meal courtesy of the Kayan women, before heading off to a small hut where I shared the sleeping space with another volunteer. The hut belonged to one of the tribal chiefs who generously opened up his home to allow us foreigners, to stay with them. In fact, in that village, they regularly open up their own homes so that visitors can gain an insight into how they live. Unlike the fake villages, there was no electricity. There were no Western-Style beds or manicured rooms. 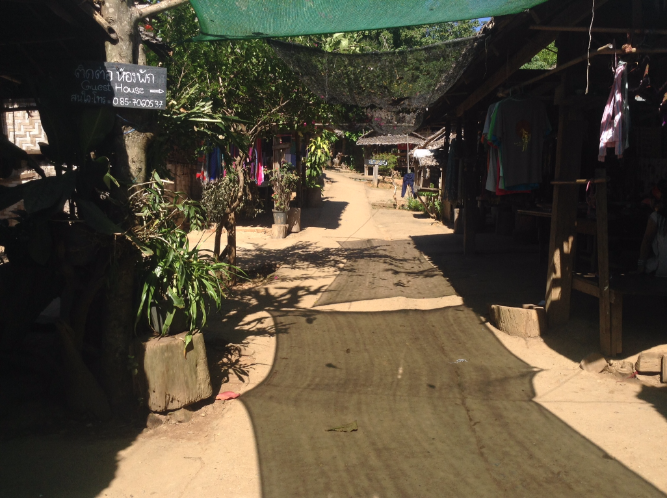 Instead I had the privilege of experiencing the raw surroundings of what was essentially a Burmese refugee camp in the heart of the Thai jungle. The room I was in was cluttered, cosy and lived-in. I loved the rawness of it. At night I fell asleep to the sound of half a dozen dogs barking, the song of the crickets, the shrill buzzing of mosquitoes and the sound of large rats scuttling underneath the floorboards I was sleeping on. The night was pitch black and my roommate was fast asleep beside me. I smiled. Because for me this was what travelling was all about: interacting with people in a far-flung part of the world experiencing things I could never have imagined otherwise. It seemed like only a few hours had passed until I was suddenly awoken by the loud cry of a single rooster. Before I had time to blink, another rooster had joined in, and then a whole orchestra of roosters, pigs and dogs followed suit. Groggily, I turned over and reached for my watch. It was 5am and the sun had already started to rise. 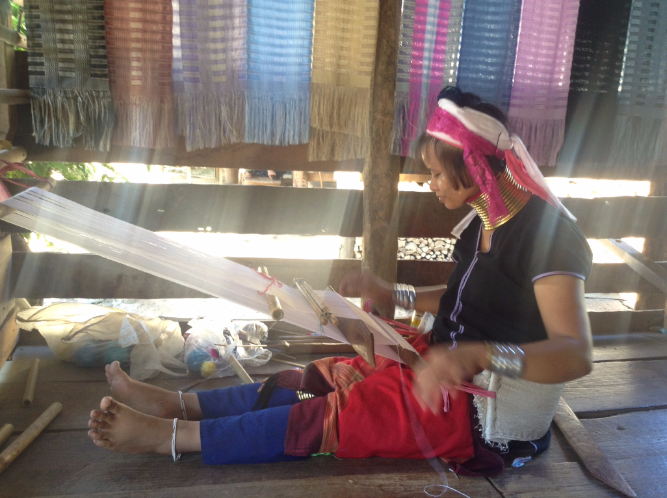 The village itself appeared to take on its own energy and I heard the creak of a nearby hut as one of the Kayan women started making preparations for the day. Then all of a sudden I heard the clang of iron pans, cutlery and footsteps as the whole village started to rise and shine. It was my first morning in a Kayan village and I had not quite come to my senses as the acrid smell of smoke filled my nostrils and I woke up to the cries of the animals which acted as a natural alarm clock. The day ahead was a busy one. After a breakfast of boiled potatoes, scrambled egg and Burmese curry leaves, we set about putting posters up, coordinating our activities with some of the local organisers and planning. I spent much of the day writing and documenting our activities in my diary, in addition to helping the Kayan tribes with any cleaning, cooking and planning activities. Before we knew it, the day of the big launch was upon us. My job was to meet and greet visitors, introduce them to key people within the organisation, and educate them about our project and what its aims were. I also encouraged them to participate in the group activities and the ice-breaker games that I had previously created. 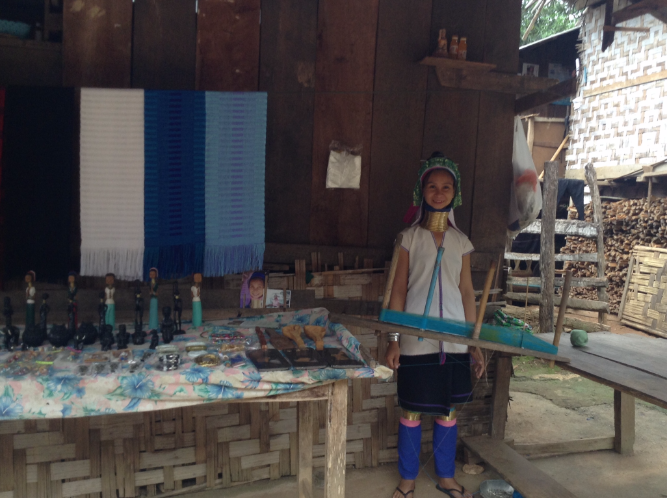 Part of the project was to encourage the tourists to take part in workshops where the Kayan people showed them the type of activities they do on an everyday basis such as scarf weaving, jewellery making, creating wooden dolls which they then sell to tourists and making wooden cutlery. 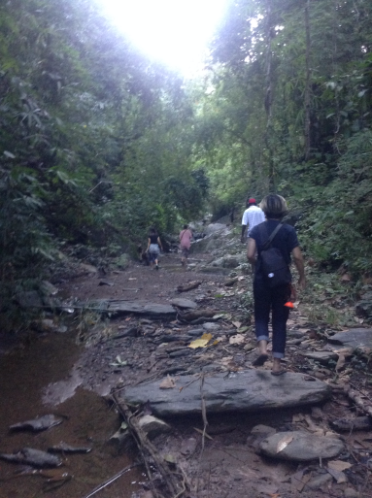 The Kayan people also like to go on medicine walks and pick local plants from the surrounding jungle to make medicines. 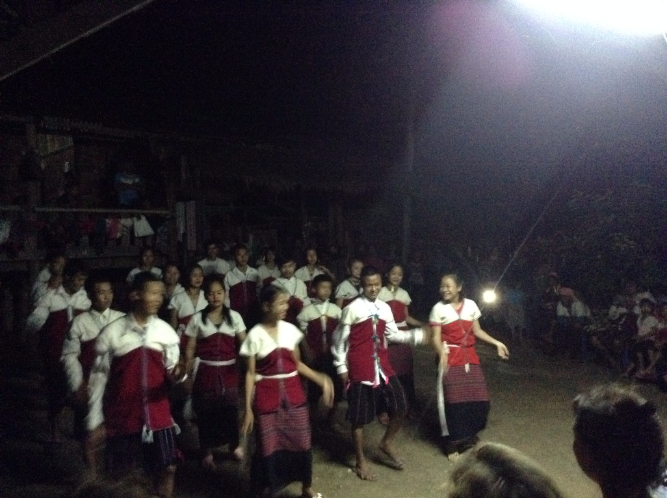 One of the major challenges of the project was convincing the Kayan people that tourists were interested in learning about their daily activities. They had been so brow-beaten by the restrictive stereotypes and demands of the Thai government that it took a while for us to persuade them that their day-to-day activities were infinitely more interesting to tourists than just staring at them and taking pictures. It was a very special privilege for me to help lead other foreigners to participate in these activities and try my hand at many of these cultural crafts myself. The 3 days I spent in the village were among the most memorable in my life. 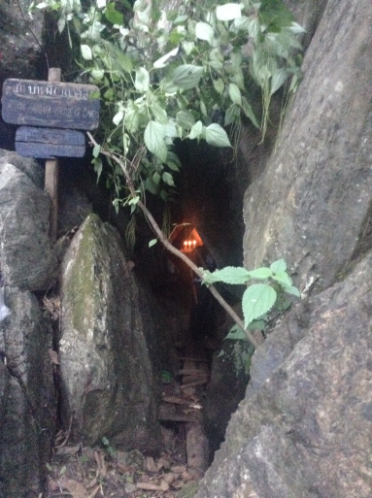 Trekking through the jungle, with a local medicine man learning about the healing properties of herbs, and climbing through a dark cave with bats flying overhead are things that I will always remember. I would often spend the late evenings watching the tribal dance shows or looking up at the shooting stars. Now back in England, those memories will forever remain with me for eternity. The life lessons I learned in the short time I was in the village have changed my perception and my approach to everything I do in such a profound way. The first lesson was the simple erosion of self-doubt. Most of my life I struggled with self-doubt. It was even starting to impact my career in marketing. While I had many successes with my career, it still wasn’t enough to make me believe in myself. But somehow, staying for 3 days in a village with people who despite having nothing, were able to make the most of everything they did have, helped to shake me out of my slumber. Sometimes it takes an encounter with a person who has nothing, to make you realise you have everything. The second important lesson was communication. Communication isn’t necessarily about language. In fact, I spent the vast majority of my trip communicating with people who did not speak the same language as me. The key to great communication is understanding. By that I mean, understanding a person’s culture, and understanding what motivates them. This can only come through listening, reaching out and making an effort to meet them on their level. And that is what I did. I made an effort to learn about the Kayan culture. I also made an effort to learn about how their experiences influence their communities on a daily basis. By coming into their territory and developing that understanding, I was able to communicate with them on a much deeper level than I could have done with mere words. This is what helped to make the project so successful. It is also an important life lesson that I now utilise in my personal life and in my marketing career. I learn to understand what influences a person before I propose a solution. I understand their challenges, their culture and then I adapt. And here we come to the final lesson. Adaptation. In order to get the most from the experience, I really had to adapt to new surroundings. These surroundings were so foreign and alien to me. I was completely immersed in an unfamiliar environment. At times it felt uncomfortable and the only option I had was to adapt. And now that I’m back in England, I can easily adapt to different working environments and people. Because by adapting, I am able to learn. I am able to maintain the type of fortitude that I need to make any project a success, just as I did in Asia. Asia changed me. I never expected to find myself when I left home that day. But the phrase ‘find myself’ is a little misleading. What I rediscovered instead, were important strengths, abilities and inner resources that I never knew I had. The wonderful Kayan people I met gave me a wonderful gift during the short time I spent with them. And that was the gift of insight.